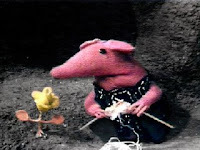 I've just heard the sad news of the death of Oliver Postgate, creator of Bagpuss, The Clangers, Ivor the Engine and Noggin the Nog. These programmes defined my early childhood, and that of almost anyone else who grew up in the 1970s. I've recently started seeing some of the modern children's programmes, and without wanting to come over all nostalgic, they don't hold a candle to this classic era of British television (though I do have a soft spot for In the Night Garden). Listening to excerpts from Postgate's programmes on the radio this mornign, what really struck home was their immense seriousness. They could be light hearted in places, but it was in their solemn attention to simple matters they were at their most childlike (in all the good senses of the word).